Plastic Model glue with applicator brush. Retail $3.30 SAVE 20% ! 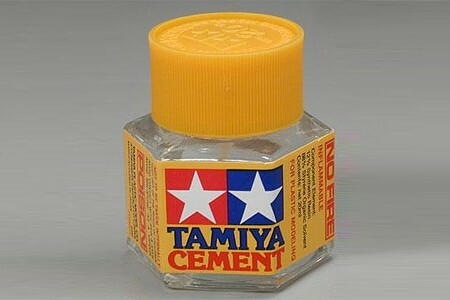 This is probably the best general purpose plastic cement ever for modeling. It&apos;s not gooey like the Testors&apos; stuff, but not overly runny. It doesn&apos;t slide where I don&apos;t want it to go, and dries in a few minutes. That&apos;s plenty of time to make adjustments. Once dried it&apos;s also easy to sand down, making detailing even easier. Just perfection. Excellent for plastic models (polystyrene plastic). This is the best Cement by far to put together Model tank tracks, you can easily put a full set of tracks together in a few hours, you can paint it with in a hour of drying to the touch,then I paint the tracks, the cement stays flexible and strong enough to attach the tracks together, this cement will set up in a few days, by then I am displaying my finished model. now if the seller can just keep it in stock, I would buy a few bottles to have on hand. For many years I have used Testors glue on my models. I would try to get a little bit of the glue onto a toothpick, and then the tube would keep leaking more and more glue. That and all the strings going from the tube to the toothpick to the model would ruin models. This product has a very handy brush inside the cap. It works so much better, and no more strings. I will be using this glue from now on. This is so much better than what I used as a kid. The brush under the lid is about 2.5 to 3mm wide. It is fairly precise. It picks up a lot of glue so I press it against the inside of the jar until I have what I think I need. In use it paints on quite nicely. It&apos;s thin but doesn&apos;t run. It&apos;s thick enough to stay where I put it but it is not blobby. The smell is like a strong fingernail polish. I put the brush back on the jar immediately. It takes a few seconds to set up so I either act frozen while I hold it or use a third hand tweezer to help. I really like this stuff.